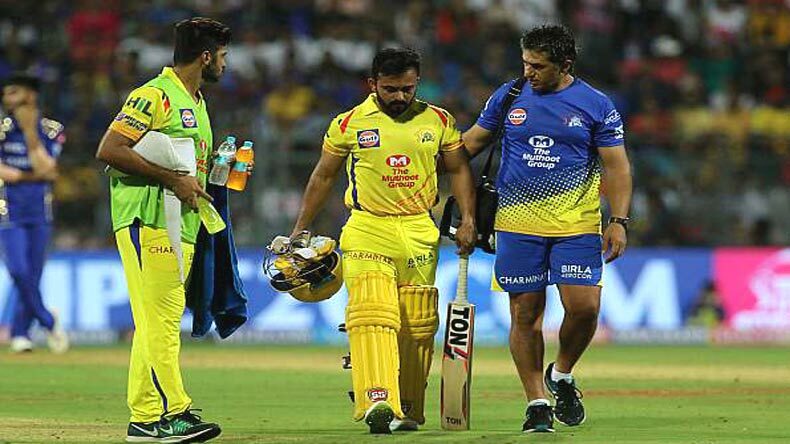 The 33-year old all-rounder who played a pivotal role in CSK's win in their opening match, following Bravo's heroics; has been ruled out for the remainder of the tournament. The team management hasn't named a replacement so far but coach Mike Hussey said that they are looking forward to the process. Kedar Jadhav went of the field in the 13th over of CSK's run-chase but came back in the last over to win them the match. Jadhav retired hurt in the 13th over of the run-chase for CSK. He, however, came out to bat again in the last over, at the fall of the 9th wicket after Dwayne Bravo’s heroics had brought CSK within a foot’s distance of victory with only 7 required of the final over bowled by Mustafizur Rahman. He then hit a six over fine leg off the fourth ball to level the scores and followed it up with a caressed drive through the covers to bring up the victory for CSK. In the post-match interview, he said that he was hopeful of recovering in time to come back to play in the yellow jersey as early as possible. The team management hasn’t named a replacement yet but Jadhav’s injury will probably push Rayudu to the middle order as CSK will look up to Murali Vijay for the opening duties. Earlier in the auction this year, CSK put immense faith in the 33-year old Indian regular after having shelled out Rs. 7.8 crores; as his previous franchise RCB chose not to retain him. In the 13 matches that he played for Bangalore last year, he scored 267 runs at an average of 22.25 and a strike rate of 143.54 with a best of 69.